Mindstorms Mayhem, a FIRST LEGO League (FLL) robotics team consisting of home schoolers from Merrimack, Wilton, Milford, Hollis and Bedford, competed against 47 champions from 39 states and five other nations to win the coveted Director's Award at the FLL International Invitational Tournament in Atlanta April 15th to 17th. The Director's Award is given to the most well-rounded team that excels in all judging categories. In December, Mindstorms Mayhem, one of several area teams sponsored by BAE Systems, competed against 48 other teams from around New Hampshire to provide both a robotic solution and a research presentation on interplanetary mission challenges. As winners of the Director's Award at the New Hampshire State Tournament, Mindstorms Mayhem represented the state at the FLL Invitational held in conjunction with the FIRST Robotics Competition Championship. Local FIRST Lego League robotics team Mindstorms Mayhem, winner of the Director's Award at the recent FLL International Invitational Tournament in Atlanta. Front (l to r): Jacob Krupkin of Milford, Melissa Gray of Milford, David Schunemann of Hollis, Nathan Streeter of Bedford, Daniel Umenhofer of Wilton. Rear: Mentor Christopher Jennings of Merrimack, Coach Ken Streeter of Bedford, Coach Bill Gray of Milford, Nathan Gray of Milford, Benjamin Krupkin of Milford, Brian Jennings of Merrimack, Benjamin Streeter of Bedford, Victoria Umenhofer of Wilton. 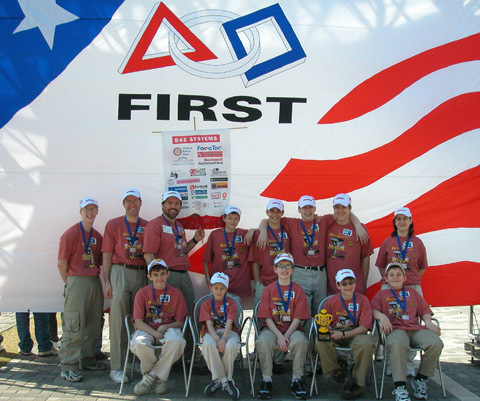 During the three day International Invitational, the team's robot competed against other robots to complete nine "Mission Mars" challenges in two and a half minutes. The missions were designed to simulate those obstacles faced by NASA scientists and engineers in the Mars rover missions. The team was also judged in technical areas, research, and team work. Mindstorms Mayhem researched power sources for future habitation modules on Mars. They determined that geothermal power is the best option if robots can discover geothermal hot spots on Mars, and presented their research as a channel-surfing skit. In five minutes the judges saw a game show, a news interview, a science talk show, a rap song, and an interview with a robot designer. 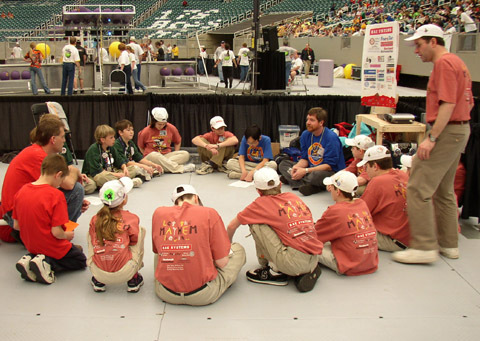 Working together and getting to know each other was a highlight of the recent FIRST LEGO League Tournament in Atlanta for members of local robotics team Mindstorms Mayhem and teams from Alaska, Mississippi, and North Carolina. Mindstorms Mayhem was also awarded the Special Assignment Award with their alliance partners from Alaska, Mississippi, and North Carolina. FLL teams were grouped into alliances of four teams each and given a Special Assignment to combine their robot missions, research "What is Six Sigma?" and develop a cheer for the alliance. Working in the alliance and getting to know kids from around the country was a highlight of the tournament for the team. FLL is an international program with a goal of giving children ages nine to fourteen the opportunity to discover how exciting and rewarding science and technology can be. The teams develop problem solving skills and teamwork as they design, build, program and operate autonomous robots to meet the year's mission challenge. For more information about the team or FLL, see the team's web site: www.mindstormsmayhem.org or e-mail info@mindstormsmayhem.org. The team is grateful to the many business, community group, and individual sponsors whose contributions made it possible for them to travel to Atlanta to compete in the Invitational tournament. Among the Merrimack sponsors were BAE Systems; George Gordon Associates, Inc.; Saint-Gobain Performance Plastics; Pete and Anita Hinkle; and Shaw's Supermarkets.